Crisis has become an important scholarly topic with Europe’s recent economic crisis lingering in the present. This paper looks at how global transformations appear from the position of severe economic crisis, and the importance of the past in understanding these transformations. 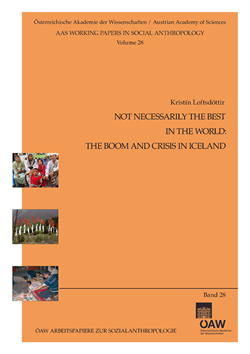 Icelandic subjectivity during the boom period and crisis engaged strongly with Iceland’s past as a Danish dependency until 1944. Nationalistic rhetoric mobilised what Arjun Appadurai has called a ‘warehouse of cultural scenarios,’ stressing during the boom period both the iconic figure of the Viking and Iceland having finally gained the status it deserved as being on par with the rest of Europe. The economic crash, however, engendered strong criticism of the boom period discourses as well as reflections on similar anxieties of belonging. The repeated references to ‘us’ and ‘them’ can be seen as attempting to create a coherent and clearly defined Icelandic subject amidst wider global transformations.